Need something more like the rest of the form. However, do you have a sample of the look and feel you are trying to accomplish? Thanks! We'll wait for your response! Thanks for your answer, we need the same look and feel of the other fields. But when you click this field need to show the options like now, understand? Saludos, veo que hablas español. Puedes explicarte mejor cómo necesitas el formulario? dices que quieres algo que se vea como el resto de los formualrios, cuales son éstos? puedes indicárnoslo? También dices que necesitas que al darle clic en un campo, muestre opciones, esto se logra fácilmente con conditional logics. Hola, yo ya tengo ese formulario, quiero mantener ese campo con opciones de (si o no) como esta ahora, pero con el estilo de los otros campos del mismo formulario. This is our form now: ok? This is your current form , and according to your request , all you need is to have the dropdown menu identical to the other fields, correct? 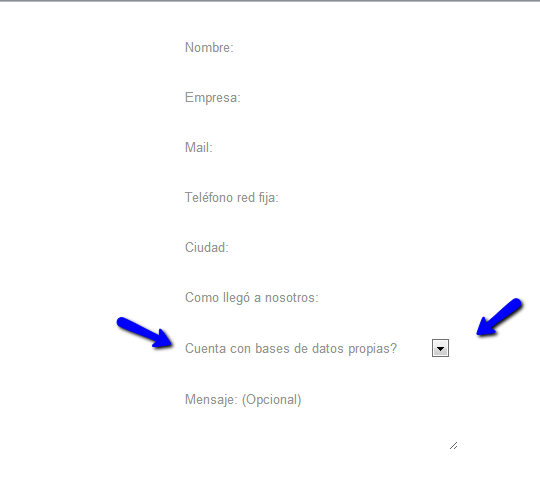 This is my test form , on that form , the dropdown menu text and style looks exactly as the other fields. So whenever you embed it, it should show the look the desired effect, as I see your page gets another background. jeanette I dont want to be disrespectful, but can you please call to your manager or someone with more experience on styling forms? I am just trying to help, and incidentally I'm the support team manager. The next level is Mr. Aytekin, the CEO. This doesn't mean I'm the most technically skilled one, I'm here to help in whatever I can, and take care not only of technical issues , but other customer related ones. I went ahead and took care of your thread as we were understaffed at that moment and did not want this thread to be there for hours. So , don't worry, we have several other supporters with CSS skills, if you think I'm not being of help. I was trying to narrow the problem, as in the beggining it was not clear to me what was actually the desired final result. 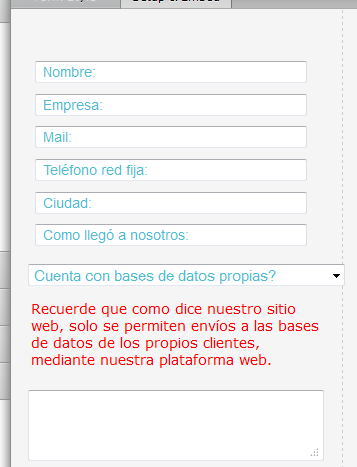 You stated you wanted to show the dropdown menu just as the other fields in that one form name (E-MAIL.CL 4.0 popup cotizar (newsletter) ) . So I started from that point. Now I can see the look and feel are different . for the image we sent you. Ok, this is the closest outcome to what you need , I have added a gray background and have changed red color of the warning message that comes when selecting "NO". The form our team leader has provided is very close to what you have requested and I imagine that its CSS would have taken some time to devise. I'm supposed to be one of the more adept at CSS around here and I must tell you that I really can't see how her code could have been improved upon. You should also be aware that no matter what code is injected, the form will never appear identical in all browsers. That's not something peculiar to JotForm. It's just the way browsers are. Sometimes we "luck out" and a form looks almost identical across a wide spectrum of browsers/platform combinations but such occurrences are fairly rare. Perhaps one of my colleagues might be able to better satisfy your request and if that be the case, wonderful! As the saying goes, more power to them! My apologies if this reply doesn't meet your expectations but I just felt I needed to clarify things a bit. - Do you see the field "Cuenta con bases de datos propias?"?? - Please check the same field from above "Cuenta con bases de datos propias? ", is almost the same than the original field (before your improve), only change colors, but what i really want is the padding to be with the look and feel of the rest of the fields inside the same form! Is this impossible? ?, Can you do this? 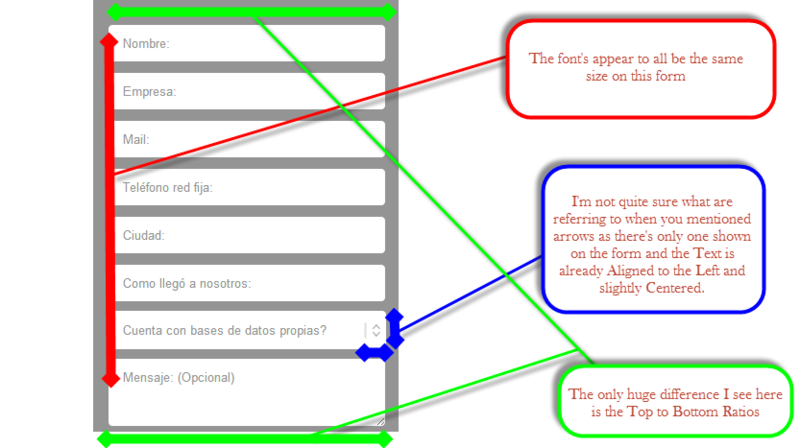 In which browser are you viewing the forms? Would it be possible for you to take a screenshot of Jeanette's form, save it to Dropbox and post its URL here, as you have done with https://dl.dropbox.com/u/12558375/Jotform/new%20form.png? Because what we are seeing in our browsers isn't necessarily the same image you see in yours. Perhaps this artical will better explain the issues we're up against. It seems My supervisor has already given you a solution. Please take a look at the form. It is not as the image you have provided. Perhaps you need to clear your cache or use Shift+refresh in order to get the updated version. As you can see, it is quite different from what you have on the last image sent. Let us know if we can further assist you! Your picture is exactly what i need, is perfect! but why i see all wrong then?? In Firefox seems to be perfect, where i can grab this fixed CSS? Maybe later will be able to remove completely the CACHE and see this perfect. We are glad we cleared up the missunderstanding. Were i can grab this CSS????? Please tell me what i need to inject to fix that field like your picture! Give it a try and let us know if you need further help! I think my colleague's form is already perfect! I've just made a little bit adjustment and styling on the dropdown field. 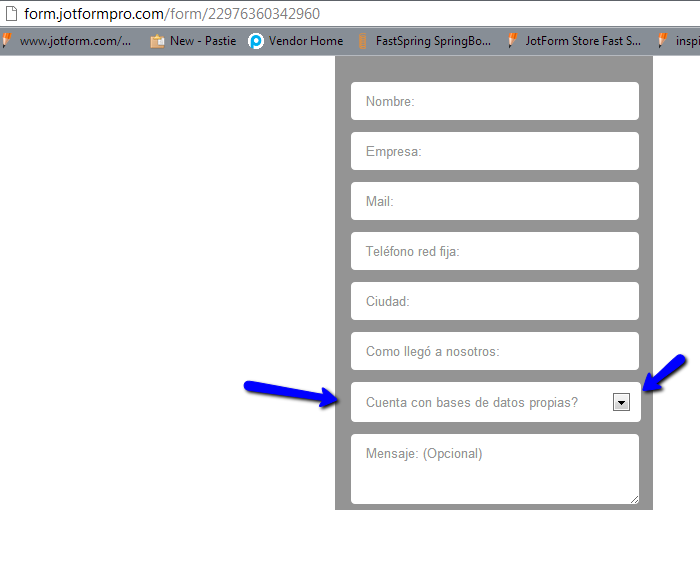 Check this form: http://www.jotformpro.com/form/22984473861970? Congrats Idarktech! you refined my form amazingly! Only need to have the same font and same font size than the rest of the form, and also the little arrows are to much to the right. If you don't want to clone this form then please share to us your finish form so we can check and give you the right codings to inject so we match your needs. Hi Xowii, I'm not quite sure what more you are trying to achieve. I see in http://form.jotformpro.com/form/21785417276966 it looks like you removed the border and frame background unless that was the previous version and you have not cloned it yet? To update to a copy of the latest version please clone this version: http://www.jotformpro.com/form/22984473861970. The fields with text are aligned center-left which is why they are offset inward (tabbed appearence) with the text. Were you wanting it centered then or? It's unclear as to what you want done with this? There's only one arrow in the form and it looks fine. What more are you trying to do or needing? Also please note that depending on the browser's engine and decoding of the source, a form like this that has been heavily customized will likely appear with slight differences across various browsers. you can check the result in www.e-mail.cl/newsletter clicking the button "cotizar ahora"
Let me know if you find anything in this final form please. I've taken a look at your form and currently it looks awesome from my end and it appears great in Chrome, FireFox, and IE. Is this something you are happy with?